This one is for all the hummus-lovers out there. Do you keep chickpeas on hand at all times? Do you eat hummus by the spoonful? Could you eat hummus at each and every meal? Then you’re gonna LOVE this Strawberry Beet Dessert Hummus! My toddler, Lily, (18 months) is currently in a major hummus phase. Literally, I’ve never seen a person eat as much hummus as she does. It’s insane! I came up with this recipe to mix up her meals and add some extra fruit and veggies into her diet. You can’t taste the beets at all but they do brighten the color! Beets are also a fantastic source of fiber, folate (vitamin B9), manganese, potassium, iron, and vitamin C.
Lily loves to eat her strawberry beet dessert hummus with sliced apples and blackberries, but it pairs well with every fruit I’ve tried. Feel free to mix up the flavors. Use whatever berries you have on hand, swap the sunflower seed butter with peanut butter, make it your own! For more kid-friendly recipes, be sure to try my famous 20 Minute Vegan Quesadillas or my Apple Pie Oatmeal Jars! 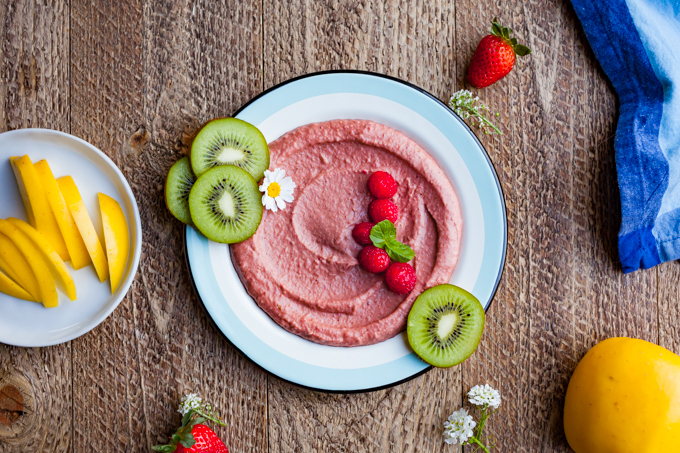 To save this strawberry beet dessert hummus recipe for later, pin the photo below! As always, I love to see your creations on Instagram! Tag me @carrotsandflowers #carrotsandflowers for a chance to be featured! This deliciously simple strawberry beet dessert hummus makes the perfect snack for toddlers and adults alike. It's creamy, flavorful, and packed with vitamins, protein, fiber, and healthy fats for optimal nutrition. Drain and rinse the chickpeas. Save the liquid from the can (aquafaba) if you like, as it makes a fantastic egg replacement in vegan baking. Wash and trim the strawberries. Add the chickpeas, berries, beets, dates, sunflower butter, and lemon juice to a food processor or high-speed blender. Process or blend until smooth and creamy, about 3 minutes. Stop to scrape down the sides as needed. Serve with sliced apples and blackberries, or whatever fruit is in season! Have you picked up your copy of 30 Minute Vegan Dinners yet? It’s guaranteed to make your life easier and more delicious!